Russia is ready to deploy nuclear-capable Poseidon underwater drones in the Pacific area as part of its oceanic multi-purpose system, Russian state media have reported. Given the poor state of relations between the Kremlin and the United States, the American superpower is evidently the primary target of new Russian weaponry, but the deployment of Poseidon could eventually become an issue for China as well. The Russians are used to presenting their “state-of-the-art” military hardware with great fanfare. Analysts are divided, however, whether the new drone-torpedo actually poses a credible asymmetric threat to US military assets in the Western Pacific and elsewhere. Russian President Vladimir Putin unveiled the development of Poseidon last March. 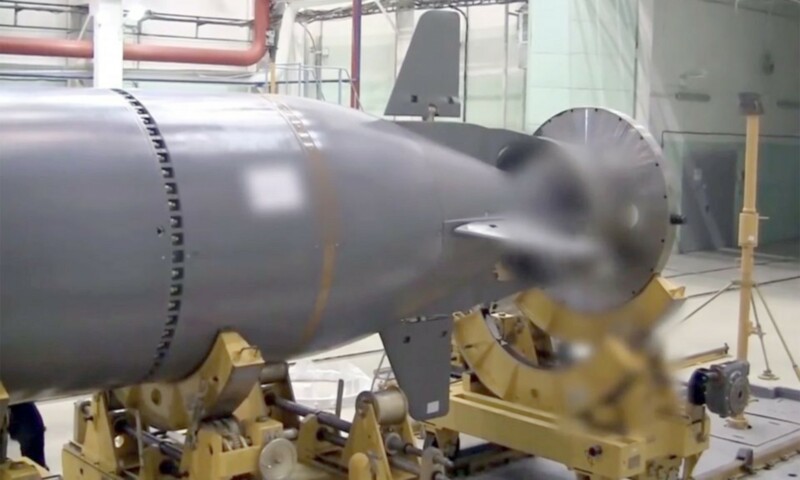 It is said the unmanned submersible vehicle can carry a two-megaton nuclear warhead and is capable of destroying enemy aircraft carriers and infrastructure facilities. It would be able to travel at a very high speed and an operational depth of up to 1,000 meters, making its interception very difficult. According to Tass newswire, the arms system is undergoing underwater trials, and two Poseidon-carrying submarines will be incorporated into the Russian Pacific Fleet another two are expected to join the Northern Fleet. Each carrier will deploy a maximum of eight strategic drone-torpedoes. Alexander Savelyev, chief research fellow at the Moscow-based Primakov Institute of World Economy and International Relations, is skeptical the Poseidon drone will have a strategic impact. “The system is obviously not a first-strike one. It does not have the capability to destroy hardened strategic infrastructure such as command posts, ICBM [intercontinental ballistic missile] silos and so on,” he told Asia Times. The Russian scholar, who was part of the Soviet delegation to the START-1 negotiations with the US at the end of the Cold War, said the torpedo would practically bring nothing to Russia’s second-strike capabilities, because its existing strategic forces of ICBMs, submarines and heavy bombers could already hit the territory of a potential aggressor with dozens, if not hundreds, of nuclear warheads even in a worst-case scenario. Still, he warned that the first use of a nuclear Poseidon drone against, for example, an aircraft carrier would mean the beginning of an atomic confrontation. In his words, the final result of this conflict would be the complete annihilation of both parties, and quite probably all the planet. Lyle Goldstein, a research professor at the US Naval War College, drew the same conclusion. “This system does pose a significant threat to US forces, Japan, as well as other allies, but its strategic significance should not be overstated,” he said. Goldstein noted that the system had not been tested in any way that could be seriously verified by the US or its allies, so doubts remain regarding its capabilities. Furthermore, handling such weapons is not an easy task. “There would seem to be obvious risks in operating a nuclear-powered drone, and especially one armed with a nuclear weapon possibly, so many believe Russia will not go beyond plans and talks,” he said. In his opinion, “doomsday weapons” such as this underwater drone can be seemingly quite easily deterred by other doomsday weapons, for example, America’s formidable arsenal of submarine-launched missiles, including nuclear ones. He insisted that any major action against the US 7th Fleet could be answered by the total destruction of Russia’s fleet and facilities in the Pacific. Muraviev argued that in the case of an open military confrontation with the United States, the Russian navy would likely make targeting main naval bases such as San Diego, Pearl Harbor or Yokosuka its first priority, particularly if they were home to principal naval assets such as aircraft carriers, major amphibious vessels, Aegis guided-missile cruisers and destroyers at the time of the attack. In this respect, the use of Poseidon torpedoes against important naval assets “would allow it to achieve strategic outcomes with a single, swift strategic strike,” he said. If the United States is concerned with Poseidon drones in the Western Pacific, China might not be that happy about their presence too. After all, the Chinese understand that these weapons can go in all directions. “Based solely on objective capabilities, China, of course, has grounds to worry about Russia’s new strategic unmanned underwater vehicle,” said Collin Koh, a research fellow at the S Rajaratnam School of International Studies in Singapore. But the relationship between China and Russia is now in good shape, so “the Chinese probably will not view Poseidon as an immediate threat,” he noted. Moreover, Koh said China and Russia should be seen as “strange bedfellows” rather than real long-term partners. “If the texture of future US-Russia relations were to change for better, this may spell some risks for Beijing,” he stressed. “In the long run, China may see Russia potentially become a ‘second front’ of challenge in the naval domain after the US. At the very least, Russia’s Poseidon will spur Beijing to hasten R&D efforts into equivalent programs,” the Singapore-based analyst said. In any case, Koh said the Chinese had recently put a lot of resources into artificial intelligence (AI), robotics and unmanned systems, so establishing a program analogous to the Poseidon drone is well within their reach.